1. Preheat the oven to 200˚C, gas mark 6; heat 3 tsp oil in a baking tray. Thoroughly mix the turkey, chilli sauce, breadcrumbs, garlic, coriander stalks and ½ the lime zest; season and shape into 4 patties roughly 2cm thick. 2. Carefully scatter the sweet potato chips in the hot oil, making sure they are spread out evenly; season and bake for 40-45 minutes, turning halfway, until crisp. 3. Meanwhile, set a large, non-stick frying pan over a medium heat and brush the burgers with the remaining 1 tsp oil. Fry for 5 minutes on each side, until browned, then place on a foil-lined tray in the oven below the chips and bake for 10 minutes, or until cooked through. 4. With a fork, mash the avocado, yogurt and remaining lime zest and juice; season. Stir through the coriander leaves just before serving. 5. 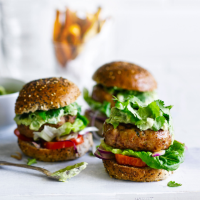 Assemble the burgers in the buns with the avocado yogurt and remaining coriander leaves, with more chilli sauce and extras such as sliced tomato, red onion or baby gem leaves, if liked. Serve with the chips. High in protein and low in saturated fat, this is a good red-meat substitute. Use it like any other mince in burgers and meatballs. Try these instead of regular spuds for chips, mash or roasties. They’re a good source of potassium, and rich in vitamins A and C.
Limes are rich in vitamin C, which helps to protect your body’s cells from damage. They’re great for seasoning food instead of using salt. This recipe was first published in Thu Aug 28 13:15:00 BST 2014.